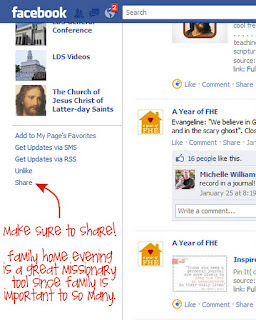 A Year of FHE: "Like" FHE & win a PRIZE! "Like" FHE & win a PRIZE! I am ready to accept 2012 sponsors and I need your help. Sponsors want to know they are getting value for their money. That lots of people will be seeing their products and exposed to their company. And that means numbers. I know from my Blog stats that around 5,000 of you are visiting each day. And that's AMAZING!!! If you have found this blog helpful, used the lessons or free printables - PLEASE take a moment and join me on Facebook. See those sharing tools in the left hand toolbar? Click on the Facebook button and then click LIKE when you get to Facebook. Next Tuesday I will draw a name from the Facebook Fans and send out a marvelous prize pack! Its contents are secret, but trust me...you're gunna LOVE it! Oh, and did I mention that EVERYONE who is a fan on Facebook gets a freebie on Tuesday? Yep. It's true. Oh, and after you LIKE the Facebook page, be sure to click SHARE to tell your friends and spread the word! Done! "Like" and "Share" I hope you get more visits!!! I'll keep sharing your awesomeness! Liked and shared. LOVE your blog!!! I liked and shared also! Your site is truly amazing! Thanks again for all your hard work!!! !